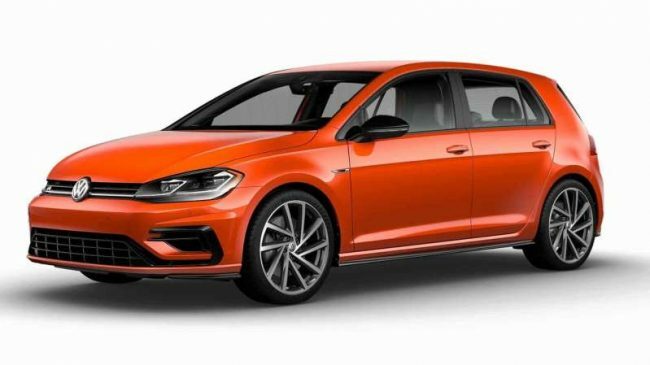 The Volkswagen Golf R is currently available in the United States in just five colors, but the number of choices jumps by 40 shades for the 2019 model year as part of what the company calls the Volkswagen Spektrum Program. Picking one of these new, vibrant hues adds $2,500 to the hot hatch’s bottom line. The image below shows the how spectrum available. Some of the colors take inspiration from other VW’s past, like Deep Blue Pearl from the fourth- and fifth-generation Golf R32, Ginster Yellow from the 1997 Driver’s Edition GTI, and Mars Red from the original GTI. Other shades come from brands in the Volkswagen Group family, like Viper Green Metallic, which is available on the Lamborghini Huracán. Some of the hues just have cool names like Nogaro Blue Pearl, Violet Touch Metallic, Caribbean Green, and Copper Orange Metallic. Picking a shade like burnt orange, purple, or teal, which are rare on new cars today, would be a cool way for a buyer to show some style with a Golf R.
VW will have a configurator online for the 2019 Golf R available soon, and it’ll let curious folks paint the hot hatch in all 40 of the new shades, including the ability to spin the vehicle 360 degrees. Interested buyers will also be able to check out a color sample kit of all the hues at dealers. The company expects customers to special order these Golf Rs, and they require a two to four months before delivery. Forty-five color choices is a rarity in the Golf R’s price segment. High-end automakers like Porsche and Ferrari offer paint-to-order options, and they are generally pricey upgrades. The 2019 Golf R continues to produce 292 horsepower (217 kilowatts) and 280 pound-feet (379 Newton-meters) of torque from a 2.0-liter turbocharged engine. Buyers can choose between a six-speed manual or optional seven-speed dual-clutch automatic.